As I have previous said, Dogen deconstructs time and space in all his writing. He wants us to enter life in this very moment which Katagiri Roshi described as the intersection of time and space. The entire body is one single true dharma eye. The entire body is the true real body. The entire body is one phrase. The entire body is the radiant light. The entire body is the entire body. When the entire body is the entire body, the entire body does not hinder the entire body. That is interesting. The entire body does not hinder the entire body. What is an obstruction if you understand that anything that arises is the profound universe itself? Our Buddha body doesn’t hinder our human body or vice versa. In Fukanzazengi, Dogen writes that the understanding of emptiness does not disturb even a single mote of dust. It is perfectly round and rolls freely round and round. A flexible mind is what Dogen’s teacher Rujing called the enlightenment mind. It is a mind that can accept every moment as it is and roll with the circumstances because everything that arises is the one bright jewel. They use the image of a pearl rolling in a bowl. This is the one time in the fascicle I still wish the title was translated One Bright Pearl! This image of a pearl in a bowl is so beautiful. 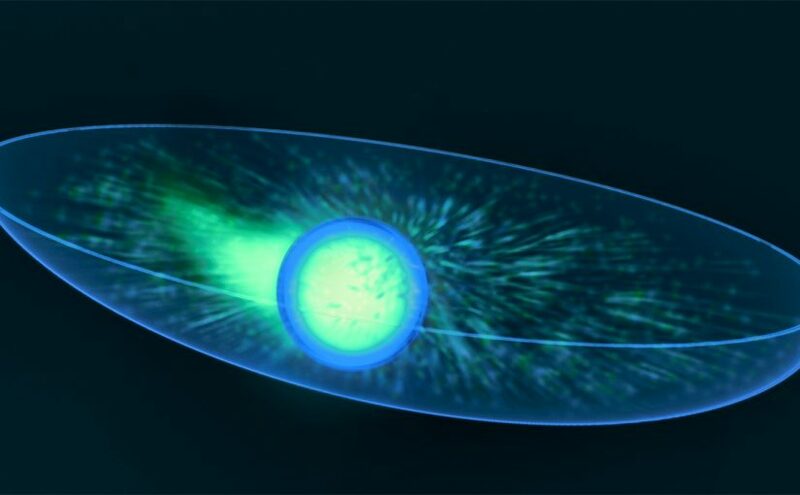 But now, I can say a marble in a bowl like the physicist’s experiments. If you move a pearl in a bowl it is perfectly round and rolls freely round and round. Because the virtue of the bright jewel manifests itself in this way, Avalokiteshvara and Maitreya are present in seeing colors and hearing sounds. There are ancient buddhas and new buddhas who expound dharma with the manifesting body. Avalokiteshvara’s name is translated “the one who listens to the cries of the world”. Maitreya is the future Buddha. Avalokiteshvara is the representative of the ancient buddhas and maitreya is the future Buddha. If there is no time, then we all can manifest either and all the bodhisattvas and buddhas. Very important to me now is my understanding of seeing colors and hearing sounds. This is exactly where the pivot of enlightenment occurs. 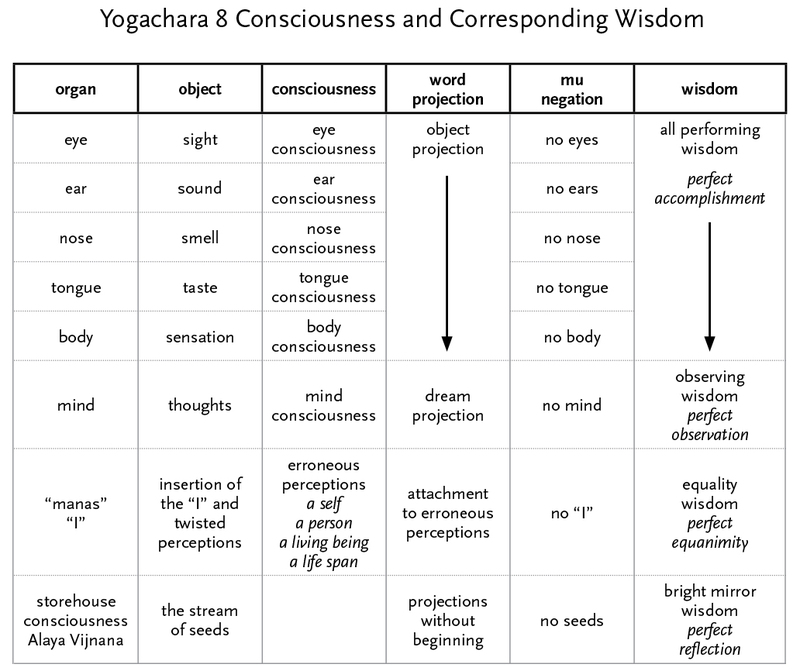 I have a chart from the Yogachara school and from the Lankavatara Sutra that teaches us how to pivot our consciousness. What a wonderful, powerful teaching. In this chart we first see the senses as we know them. Eye, ear, nose, tongue and body are the organs. The objects are sight, sound, smell, taste and sensations. We have a corresponding consciousness to each organ and object. We then have what is called the object projection which is the ‘naming” of what we experience. Not only do we name our experience but we add on many layers of stories onto the experience which in this chart we are calling “our projections”. The Buddhists add on a sixth sense, that of the mind with its object of “thoughts” and its mind consciousness. What are considered the projections of the mind are our dreams and stories that we spin around each thought. The next column is entitled mu-negation. This is the negation we find in entering non-thinking, shunyata or an experience of no-consciousness. In this state, everything is negated. We see that the world we project is a dream or an illusion. First the organ: no eyes, no ears, no nose no tongue, no body, no mind. Then the consciousness: no realm of sight, no realm of sound, no realm of smell, no realm of taste, no realm of touch, no realm of mind consciousness. Finally, the last column. A practitioner teaches him or herself the dharma. We teach our consciousness to go from projection to pivoting to wisdom and understanding. We can do this through our understanding of emptiness and interdependence. If we understand our consciousness, we can change samsara to nirvana. For the first 5 sense gates we can manifest all performing wisdom or perfect accomplishment. For the Mind/thought gate of the senses, we can convert to Observing Wisdom or perfect observation. Moving down the chart we encounter our dear friend, Manas or the consciousness that produces an “I”. Manas is the part of our minds that circles everything around the delusion that we are a separate self. The organ is our sense of a solid “I”. The object is all the twisted perceptions that are made up of our desires and poisonous minds of greed, anger and ignorance. This manas consciousness is our erroneous perceptions. The Diamond sutra describes this misperception of thinking as a self, a person, a living being and a life span. The projection is our attachment to these erroneous ideas. The insight is that there is no “I” and the wisdom is Equality wisdom or perfect equanimity. This wisdom expounds that “I” and “thou” are equal and the same. This wisdom is that no matter our desires, and the ups and downs of our storied life, we can convert each moment to equanimity. Lastly, we have the storehouse consciousness or Alaya Vijnana. Sometimes called the collective unconscious but it is more and slightly different then how we use that term in psychology. These are all the karmic seeds that have ever been produced in all realms; personal, ethnic, national, global, impersonal. These are the stream of all seeds that can be watered and come into the world. These seeds are without beginning. They are endless. In certain states of mind, we can understand that there are no seeds like the Heart Sutra and mu-negation. The wisdom in this consciousness is Bright mirror wisdom or perfect reflection. Our minds are so clear that we can, in a pure way, simply reflect what is. Thich Nhat Hanh has a strong teaching about the storehouse consciousness. He says, through close observation of our minds, we can water the wholesome seeds that will produce good in the world and we can pull the weeds of harm. This constant activity is what Dogen has called making a livelihood in the demon’s cave of the black mountain. So, can we do this perfectly? Is enlightenment about perfection? No! Perfection is part of manas, twisting everything we do according to the evaluation of good and bad, right and wrong, success and failure. What is good for our reputation? No, perfection is a demon to enlightenment. When it arises, pull the weed! 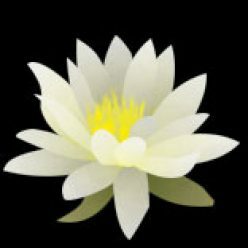 Dogen talks about practice/enlightenment. First off, each moment is the bright jewel whether we know it or not. Secondly, if our concentration and mindfulness is strong enough, we can begin to see the moments as they arise. We can then practice pivoting each moment from samsara to nirvana. We can practice the wisdoms. When all is lost and I’m doing everything terribly, I just become Avaloketeshvara and have mercy on myself and others. I listen to my own terrible cries and the world’s cries and I water the seeds of compassion. In this understanding, we can never fail. We either can pivot to wisdom or pivot to compassion. Buddha has two arms – wisdom and compassion. Thus this practice, our practice/enlightenment, continues forever – one continuous line of immediacy. This mind is non-distractible and clear. It does not grab on or reject. It meets. It meets each and everything as Buddha. It takes care of each and everything as Buddha because it sees the truth of the mystery of life in each phenomena arising. The ancestors call this flexible mind like a pearl in a bowl, freely able to move in an unending flow in any direction with no obstacles.